getting a good dose of seaspray. Used a bit of AI remix in topaz Studio. Nice to see water in liquid form! Nice editing. Great capture Diana! I don't have Al Remix but I like the artistic effects it does. Wow, great capture and colors! Must make you smile to think of this gorgeous day when others are posting their pictures of "all that snow"! Beautiful and vibrant colors! Fav. Ooh what stunning colours and such an energetic shot! Love the spray, well ETSSOI ed! Fav. Wonderful capture of the breaking wave with the lighthouse as a backdrop. Really wonderful. I love the sea spray. Terrific stop action on the spray and beautiful vibrant colors to your photo, Diana. Fantastic colours & great shot! How do you get on with AI remix, I have tried once of twice but I am not sure if I really like it. Maybe I don't us it properly. A great capture of this nice lighthouse and the editing add much to it. 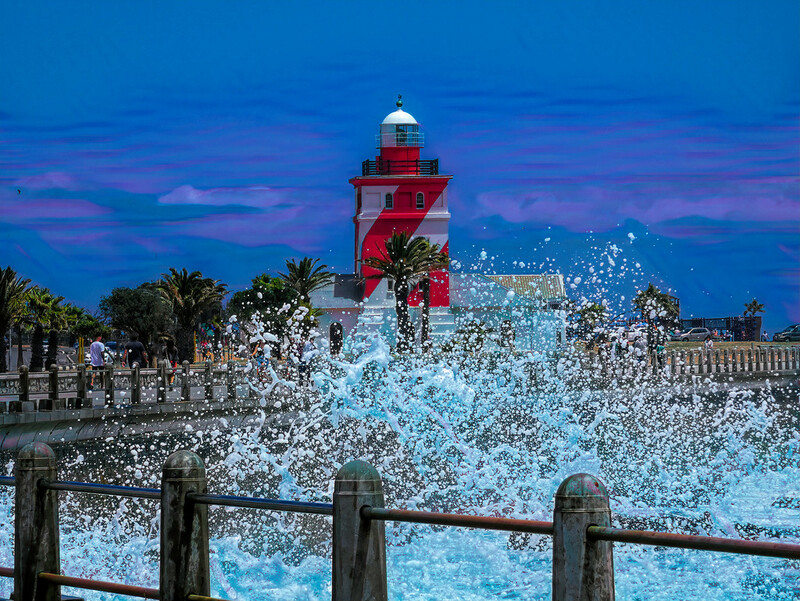 Very pretty lighthouse...........love the power of water movement! Great capture! Love the colors.